(fermented in stainless steel tanks and aged for two years in 60 percent French and 40 percent American oak barrels, one-third of them new; bottled unfiltered) Deep ruby. 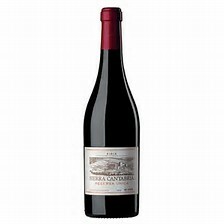 Bright and energetic on the highly perfumed nose, displaying an array of red fruit and floral scents and suggestions of vanilla and white pepper. Silky, seamless and focused on the palate, offering sweet raspberry and cherry flavors that put on weight as the wine opens up. The floral note returns on a long, juicy finish shaped by smooth tannins.